A rail corridor feasibility study of the CSX/Seminole Gulf Corridor was conducted for the Lee County (Florida) MPO by a consulting team headed by David Plummer & Associates. Other members of the team include Spikowski Planning Associates, HDR Engineering, Dave Douglas Associates, and RMI Midwest. This study assessed the long term feasibility of implementing public multi-modal transportation options within the rail corridor through Lee and northern Collier County, while maintaining and possibly expanding freight service in the corridor. 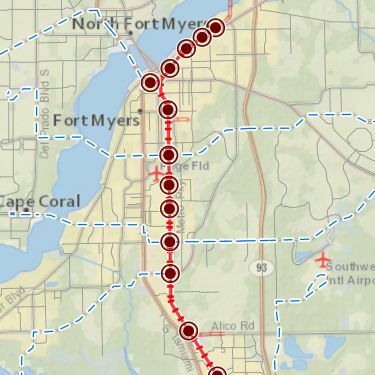 The multimodal options include running commuter rail transit, light rail transit, bus rapid transit, and/or a multi-use path from the Charlotte County line through Lee County into northern Collier County. This study also assessed existing and future freight issues, determined the preliminary value of the CSX/Seminole Gulf Lease and Leasehold, and looked into various options of preserving the corridor including purchasing rail interests (buying the underlying right of way and/or the SGL lease), negotiating new and/or existing agreements, and adopting supportive comprehensive plan and other preservation policies by local governments and MPOs along the rail corridor. The study began in September 2012 and was completed in October 2013. An executive summary highlights the findings, conclusions, and recommendations. A full report summarizes the twelve technical reports that document the complete findings of this study. On November 22, 2013, Lee County's MPO Board voted to approve the study's recommendations. Minutes of that meeting are available from the Lee County MPO website.